Question: What do almost all the most important occasions in a guy’s life have in common? Answer: More often than not they involve wearing a suit. Whether it’s a wedding or interview, if you want to make the right impression, and stand any chance of looking good in photos, your tailoring game needs to be up to scratch. Thing is, though, with such a confusing array of options out there, it can be hard to know where to start. Or, indeed, how to get your hands on a high-quality two-piece without having to auction off half the contents of your flat. But that’s where Topman comes in. The high-street hero is on a mission to make every man’s life easier, by offering standout suits that cover all of life’s big moments, at prices that won’t break the bank. Now that’s smart. Sometimes suit shopping can feel like all the fun of a finger in the eye, but it needn’t be this way. The hardest, but most essential, part is nailing the fit. From there on in, it’s a sartorial cakewalk. Helpfully, Topman has ultra-sharp silhouettes for every body type, from Slim and Muscle cuts to Spray-on and Ultra Skinny fits; meaning you’re sure to find something that is right for you, and your look. For SS18, Topman has introduced a fresh new colour palette, featuring retro oranges and of-the-moment pastels, with details like embroidery and eye-catching prints dialling up the dandy factor. For work and those occasions where you need to be less showy, there’s also a range of styles in can’t-go-wrong classic black, grey and navy. What’s more, the collection is supremely affordable – with prices starting from £100, these are suits that’ll fit your budget, as well as you. If your tailoring collection is in need of an overhaul, Topman has your back – plus your front, sides and inside leg – with a suit for every occasion this season might throw at you. Got nuptials to attend? Whether it’s your own big day or a mate’s, earn admiring looks from the congregation with a suit in pastel tones. Not only are washed-out colourways having a moment in the world of menswear, they’re perfect for sunnier weather – ideal if you’ve got a ceremony to attend abroad. Or, as an alternative to ice-cream shades, choose a suit in rich, vintage tones to give your look that Mad Men edge. Style with a pair of classic loafers and a bare ankle, and you’re sure to be the best-dressed man in the room (whether you’re the actual best man or not). The first days of a new job can be daunting – but there’s no need to let it show. The right suit can be a major confidence booster, and allow you to show a bit of personality. Given that you’ve got past the interview stage, and your foot’s through the door, you can afford to loosen up. Try checks or jewel tones for a smart way to add character to your work wardrobe and stand out in a sea of navy. On dress-down Fridays, pair your suit trousers with a white T-shirt and trainers for a look that’ll take you from morning meetings to post-work drinks in style. Regardless of your actual conduct at up until this point, graduation is a day to look smart and sober. Navy and grey are your best friends here. Every man can benefit from owning a suit in each colour, so whichever you don’t already have is the one you should opt for next. Just add a freshly pressed shirt and polished Oxfords to look sharp holding that scroll, and you can also feel smug knowing you’ve invested in a slick wardrobe staple that will see you through many more formal events to come. Blame it on #ThrowbackThursday, but when getting dressed for a big event these days, it’s important to consider how your look will age in photos. For anything that requires a true formal look, such as prom, it’s hard to go wrong with a natty white dinner jacket and black trousers. Below, a tapered leg help keeps the vibe modern, whether you opt for a pair with a side stripe or not. 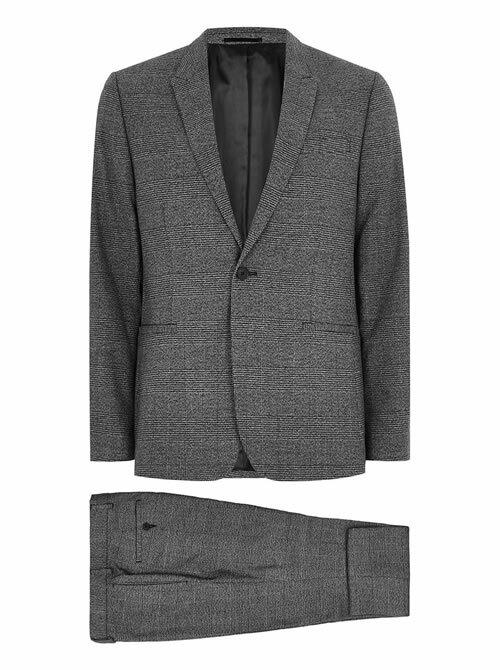 And as for your DJ (that’s dinner jacket in menswear speak), there’s also the option to try a contrast lapel. Depending on the occasion, you could take the whole outfit to a new level of slick by teaming it with a pair of white sneakers. All you need to work on then is your dance moves. When it comes to suiting up for a night on the town, it’s a case of go big or go home. Pull out the big guns with a two-piece in a bold pattern. Vertical stripes will see you score high in the style stakes this season, or get fully into the spring spirit with statement florals. If the top-to-toe look feels like a step too far, wear the jacket or trousers as separates, paired with slim-leg jeans or a T-shirt. Now go forth and party, you animal. Shop the full spring/summer 2018 tailoring collection now in stores and online at topman.com.